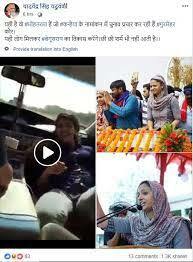 A video showing a woman dancing in the front seat of a moving car is being shared online with a false narrative that is shows student activist Gurmehar Kaur while campaigning for CPI candidate Kanhaiya Kumar in Begusarai, Bihar. The video shows a woman dancing in a car to the tune of a Hindi film song. And the images are those of Shehla Rashid, former vice president of Jawaharlal Nehru University’s students union. Clearly, Gurmehar Kaur is not present either in the video or the images from Kanhaiya’s campaign rally. The post can be viewed here and the archived versions can be accessed here and here. The 2.15 seconds long video shows a woman dancing inside a moving car while a group of youngsters cheer on. The song playing in the background is that of a Hindi film. The viral post claims that the woman in the video, and the one standing by Kanhaiya Kumar’s side at the rally, are the same — Gurmehar kaur. 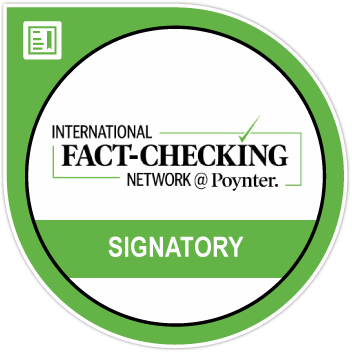 Both claims are false. The post, as of now, is going viral, both, from Facebook and Twitter. BOOM fact-checked the video and the images separately. Who is the woman in the car? This makes it clear that the video is not from India. 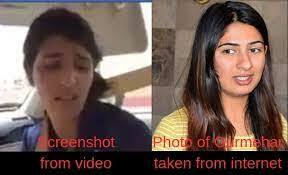 BOOM then fragmented the video and took mugshots of the woman claimed to be Gurmehar, which we compared with pictures of Gurmehar we found online. We also reached out to Gurmehar Kaur. She replied saying the claim was false. The student activist also told us that she had campaigned for Kanhaiya Kumar in Begusarai. 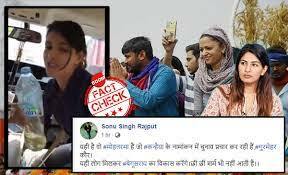 While BOOM confirmed that the woman shown in the video is not Gurmehar Kaur, we were unable to establish her identity but we found the same video on YouTube uploaded in August 2016.
Who is the woman in the photo? A reverse image search on the picture directed us to several news reports carrying the same photo. The woman in the photo is Shehla Rashid. Rashid is the former vice-president of JNU’s student union and a member of the Jammu and Kashmir Peoples’ Movement, a political outfit founded by former IAS officer Shah Faesal. 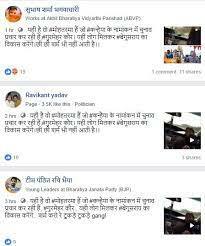 Rashid, along with several others, has been proactively campaigning for Kanhaiya Kumar who is ready to fight his maiden election from Begusarai.